Retirement is changing in big ways and one of the biggest drivers of change are the baby boomers. The baby boom started back in 1946 and for 20 years, there was a massive number of babies born. The earliest boomer has turned 65 and for the next 20 years we are about to see massive number of people deal with retirement. For the past 15 years, I have been teaching retirement workshops and one of the biggest changes to planning is that more and more of these boomers are planning to work in retirement. 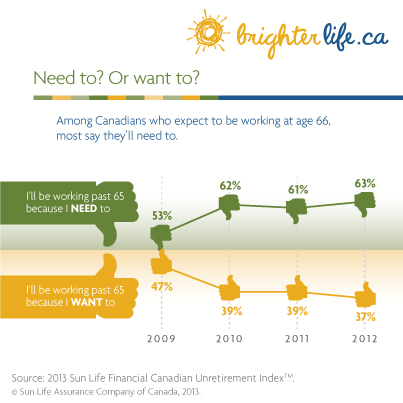 Sun Life has just release their Fifth annual Unretirement Index survey. New research by Sun Life and their Unretirement index suggests that the latest trend is that boomers are planning to work longer and retire later. Heres some of their key findings. For the first time in five years of tracking retirement trends, the index found that the number of Canadians who expect to be retired at 66 (27 per cent) is almost equal to Canadians who expect to be working full time at 66 (26 per cent) and almost another third (32 per cent) expect to be working part time at 66. Why are Canadians planning to work past 65? 63 per cent expect they will need to work past 66 compared with 37 per cent wanting to work. With Canadians expecting to be retired for an average of 20 years, over a third (38 per cent) say there is a serious risk of outliving their retirement savings. Almost a third (31 per cent) of Canadians are not at all confident that they will have enough for medical expenses. The survey also found that Canadians have a gap in their thinking about retirement savings. They anticipate requiring an average income of $46,000 per year for their retirement yet they are only aiming to have $385,687 in retirement savings (excluding their home and other property). At the same time, only a quarter of Canadians (23 per cent) stated saving for retirement was their number one priority. Paying down debt or credit cards was the number one priority for nearly half of Canadians. The priority placed on saving for retirement varies with age. It was a top financial priority for 37 per cent of early Boomers in the 57 to 65 year age group. The number dropped to 12 per cent of people in Generation X – 30 to 46 year old age group – who say it’s their top financial priority. In terms of their investments, interest rates are on the minds of Canadians. Twice as many Canadians (25 per cent) want the interest rate go up in 2013, compared with the number who want to see it decline (13 per cent). There are also differences in age groups. Thirty one per cent of early boomers (age 57 to 65) want to see the interest rate rise compared to 24 per cent of Gen Xers (age 30 to 46) and late boomers (age 47 to 56). I’m not clear about this: “The survey also found…Canadians…anticipate requiring $46,000 per year for retirement yet they are only aiming to have $385,687 in retirement savings.” Do they mean they need $46k from their savings on top of their CPP, OAS and any work pension plan? If you have, say, a teacher’s pension plan, you could easily have the $46k from your work pension, OAS and CPP without having any personal savings. I would be 99% sure that the $46k is inclusive of CPP, OAS and any company pension plan, so as you say some teachers or others with good pension plans shouldn’t need any additional savings to reach the $46k income. The problem with averaging though, is that this group of people would probably have a higher target than the average of $46k.